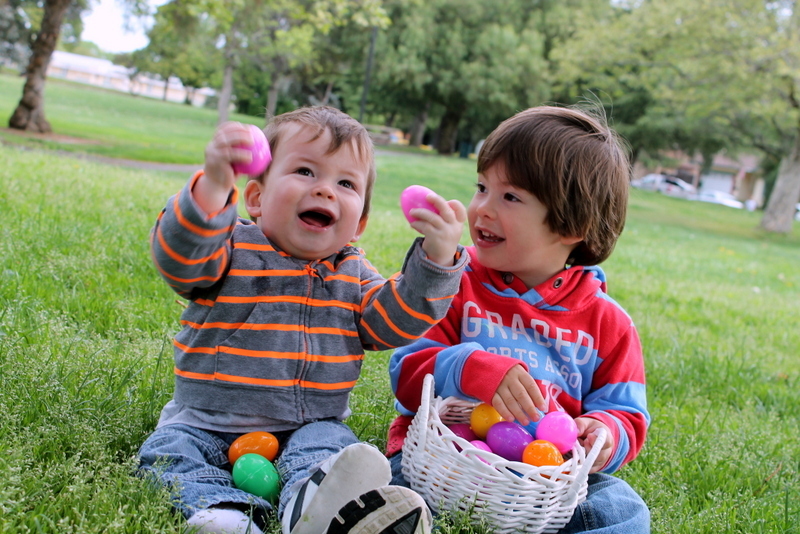 So my kid’s both had their first Easter in the US. 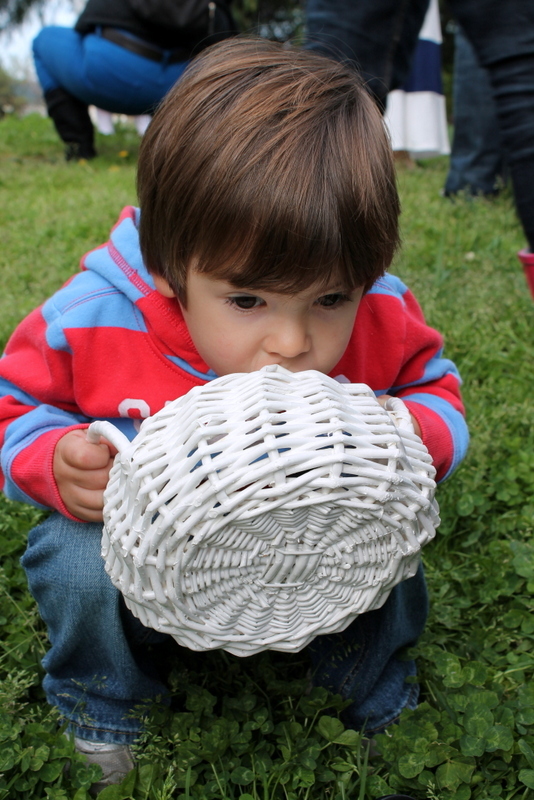 My almost 3-year-old never experienced American Easter. In Brazil we didn’t get to have Easter egg hunts, just one giant chocolate egg of yumminess. So I bought some eggs and we did a “practice” hunt in the back yard, so the poor little guy would have some incentive the day of. t.
When we got to the field, all set up for the 1-3 year-olds he was definitely in game mode. My husband was coaching and prepping him as he took a lay of the field, which egg he would go for first. He was great, quick, decisive, swooping in and grabbing eggs as older 3 year olds were going for them as well. Granted the eggs were spread out ever 1-2 feet, but he didn’t know that, he thought he was king of the field. 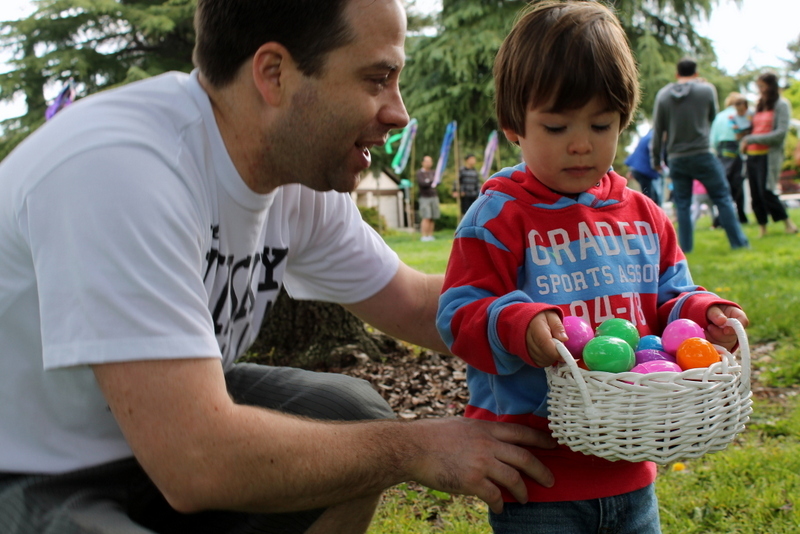 He wasn’t the only one who got to enjoy the Easter egg hunt. 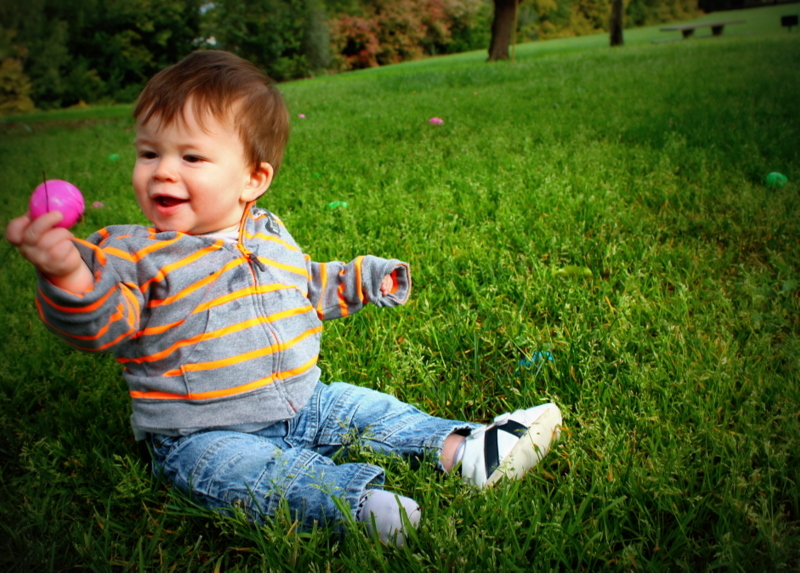 His bro was just 2 weeks shy of being 1 so we figured he could participate as well… we just took him to the end of the field, and dropped him the grass. Pure joy. Our nanny is kind of like our 3rd teenage kid. 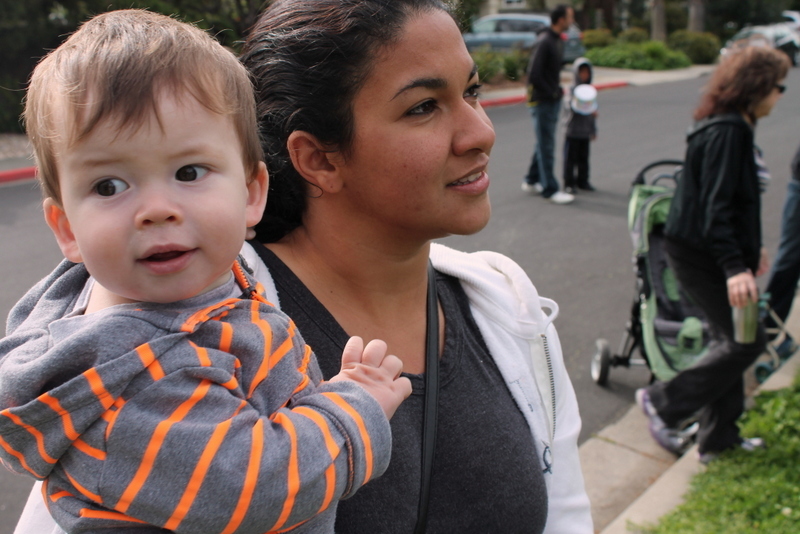 She joined us to experience her first American Easter. We also put together a little basket of chocolate bunnies, and other American Easter candy. Because other than giant chocolate eggs, I still love my peanut butter candy filled Easter baskets… and Brazil has nothing on jelly beans! She had been having some “saudades” for Bis, so when her basket was full of Kit-Kats she was more than happy. We also filled my son’s eggs with Starburst jelly beans, M&Ms and a mini-KitKat. What that means is that he opened each egg for a 2 M&Ms or jelly beans, and threw the KitKat bar to her. The hollow chocolate bunny (Lindt of course so we were at list similarity to Brazil) was as close as I could get to a giant hollowed Easter egg. All and all everyone one had a phenomenal time. 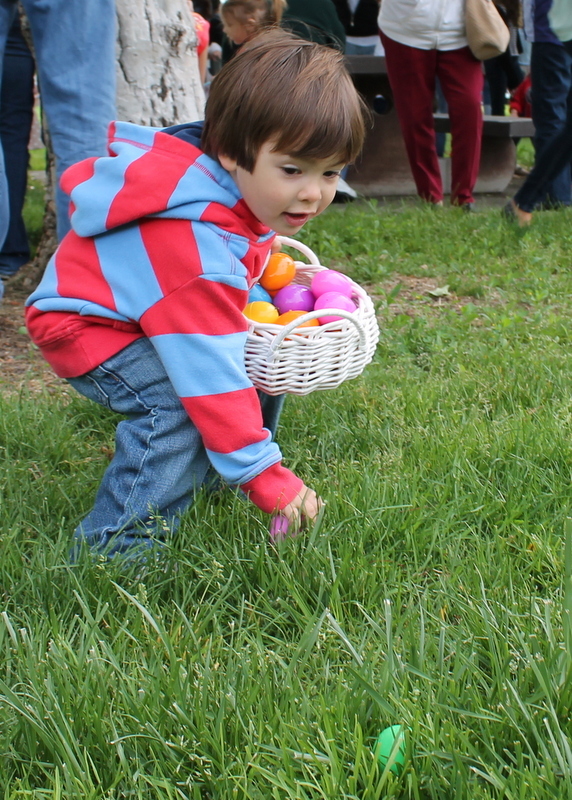 I was worried about the sheer number of eggs my kid collected… after all we still had our own family Easter hunt to get to as well. 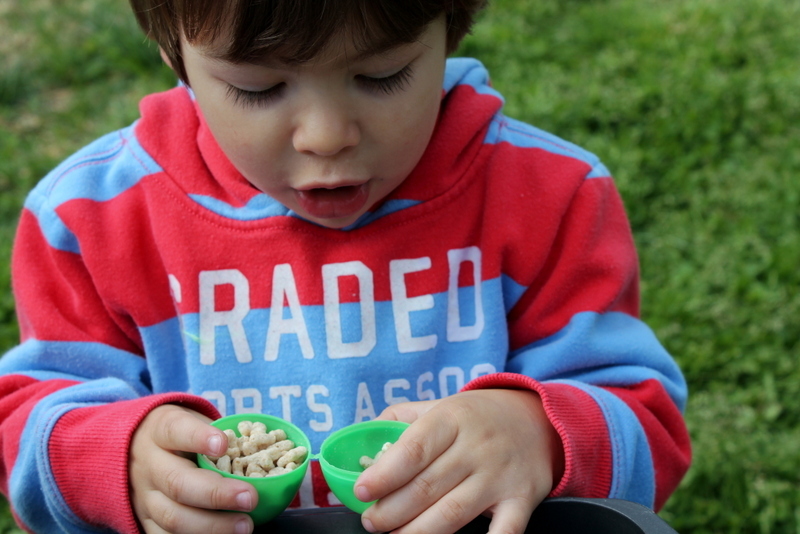 My youngest just loved that he could shake the “Baaaas” .. the concept of eggs isn’t something he gets yet. The other one is still mixing his English and Portuguese, so they were “oggoovos. ” Egg+Ovos. But the best Easter surprise was mine, each and every egg was chock full of Cereal, Froot Loops and Lucky Charms. It was pure awesomeness…after all most of those cereals are pretty much like candy anyway, but not quite as bad as chocolate… I think. Posted in Expat Life. Bookmark the permalink.